In recent years there has been a general realisation that supported gold and gold bimetallic nanoparticles can be very effective for a broad range of redox reactions. In this paper we review the preparation of gold palladium nanoparticles using a sol-immobilisation methodology and show their effectiveness for the oxidation of benzyl alcohol and the direct synthesis of hydrogen peroxide. Gold for many centuries has held a special place in the attention of the general public partly due its intrinsic value but also because of the beautiful jewelry and artwork that can be created from it. The reason for this is that gold is the most noble of metals and consequently is considered immutable. From a chemical perspective, gold has therefore relatively little inherent interest as it appears in its bulk form to have a very limited chemistry. However, a major discovery of the 1980s was that gold, when sub-divided down to the nanoscale, can be highly reactive and can activate small molecules. This has led to an explosion of interest in the chemistry of gold and, in particular, the synthesis and use of small gold-containing nanoparticles as redox catalysts. On the basis of many studies, Au nanoparticles have been shown to be particularly effective for a broad range of oxidation and hydrogenation reactions as well as chemical synthesis [1, 2, 3, 4, 5, 6, 7, 8]. These include the low temperature oxidation of CO , especially when used as part of the processes for purifying a fuel cell feedstock [9, 10], the synthesis of vinyl chloride by the hydrochlorination of ethyne , the selective oxidation of alkenes to epoxides [12, 13] and alcohols to aldehydes  as well as selective hydrogenation . 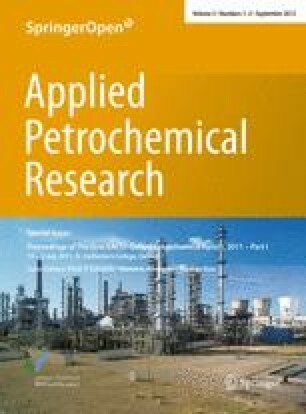 Recently, research in our groups has shown that the alloying of Pd with Au can enhance the activity of the nanoparticles, and such materials have been found to be particularly effective for the direct synthesis of hydrogen peroxide from its elemental constituents [16, 17, 18, 19, 20] and the oxidation of alcohols . In this paper, we review an aspect of our work concerning the synthesis of supported Au–Pd alloy nanoparticles prepared by sol-immobilisation for two important classes of redox reaction; namely the direct synthesis of hydrogen peroxide and the oxidation of benzyl alcohol. These two reactions have very broad interest in the chemical community as they both display key features concerning selectivity control. In the case of hydrogen peroxide synthesis, it is important that the non-selective formation of water is minimised, and in the case of alcohol oxidation to the corresponding aldehyde it is essential that the over-oxidation to the carboxylic acid is minimised. By way of background information, hydrogen peroxide (H2O2) is a major commodity chemical  and has significant uses in cleaning and bleaching. At present, H2O2 is produced using an indirect process which involves the sequential hydrogenation and oxidation of an alkyl anthraquinone, thereby avoiding the potential for explosive contact between hydrogen and oxygen to occur . The direct synthesis of hydrogen peroxide is not a reaction that is easy to control, since the formation of water is preferred under all conditions, and the quest to find a suitable catalyst for the direct reaction between H2 and O2 has remained a challenge for almost a century, and as such, it has attracted considerable attention. Supported Pd catalysts have been the focus of much of the research [24, 25, 26, 27, 28, 29, 30, 31, 32]. Our work on this topic [16, 17, 18, 19, 20] has shown that a combination of Pd with Au promotes both the activity and the selectivity for the direct H2O2 synthesis reaction. Furthermore, these catalysts are also very effective for the oxidation of alcohols, and once again the addition of Pd to Au increases both the selectivity and the activity . The link between these two reactions is considered to be at the level of the possible surface intermediates present during the reaction, and it is thought that a surface hydroperoxy species may be responsible for the selective chemistry observed in both processes. In our initial studies [16, 17, 18, 19, 20], we used a wet co-impregnation method to prepare gold–palladium nanoparticles and concluded that either homogeneous random alloys or core–shell structures  could be formed. Based on this work, we hypothesised that small homogeneous Au–Pd nanoparticles were likely to be the active species in these catalysts and we set out to utilise a sol-immobilisation method  in an attempt to ‘tailor-make’ these nanoparticles. We reasoned that since the volume fraction of these ultra-small alloy particles formed using the co-impregnation method was quite small [19, 20], pre-forming colloidal nanoparticles should be more material efficient and hence overcome this problem. We found that this latter method can indeed produce well-defined particle size distributions . However, the catalysts do not retain the selectivity displayed by the catalysts prepared by wet impregnation [16, 17, 18, 19, 20]. This paper reviews some of the essential structural features and reactivity traits of Au–Pd alloy catalysts prepared using a sol-immobilisation method. In our studies that are highlighted in this brief review, we have used the following general method for catalyst generation by sol-immobilisation . It presents a facile method of reproducibly forming either mono-metallic or bi-metallic nanoparticles. For the preparation of supported Au–Pd colloidal materials, an aqueous solution of PdCl2 (Johnson Matthey) and HAuCl4·3H2O (Johnson Matthey) of the desired concentration was prepared. Poly-vinyl-alcohol (PVA) (1 wt% aqueous solution, Aldrich, MW = 10,000, 80 % hydrolyzed) and an aqueous solution of NaBH4 (0.1 M) were also prepared. For example, a catalyst comprised Au–Pd nanoparticles with 1 wt% total metal loading on a carbon support (Aldrich G60) was prepared as follows: to an aqueous PdCl2 and HAuCl4 solution of the desired concentration, the required amount of a PVA solution (1 wt%) was added [PVA/(Au + Pd) (wt/wt) = 1.2]; a freshly prepared solution of NaBH4 [0.1 M, NaBH4/(Au + Pd) (mol/mol) = 5] was then added to form a dark-brown sol. After 30 min of sol generation, the colloid was immobilised by adding activated carbon (acidified at pH 1 by sulphuric acid) under vigorous stirring conditions. The amount of support material required was calculated so as to have a total final metal loading of 1 wt% and the molar ratio of Au:Pd was varied by adjusting the relative concentrations of the metals in solution. After 2 h the slurry was filtered, the catalyst washed thoroughly with distilled water (neutral mother liquors) and dried at 120 °C for 16 h. It should be noted that there are a range of protecting ligands other than PVA that can be used, as well as a range of alternative reducing agents. Variation in the reaction parameters can lead to different particle size distributions and represents an important way of controlling and varying the nature of the nanoparticles that can be obtained. For instance, by co-adding the Pd and Au precursors, this method can be used to prepare sol-immobilised Au–Pd nanoparticles that comprise homogeneous alloys. However, by varying the order of addition of these reagents  it is possible to prepare nanoparticles that exhibit core–shell structures and examples of these are given in Fig. 1 together with an example of homogeneous Au–Pd alloy nanoparticles. 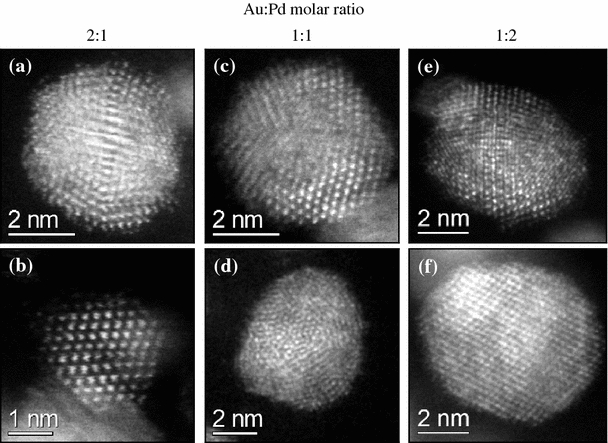 The existence of core–shell morphologies is readily discerned due to the inherent Z-contrast of the Au and Pd in high angle annular dark field (HAADF) STEM images. One of the great advantages of the sol-immobilisation method is the flexibility that can be attained with respect to tuning the composition of the alloy nanoparticles. As an example, we prepared a range of Au, Pd and Au–Pd colloidal sols (Au:Pd = 1:0, 7:1, 2:1, 1:1, 1:1.85, 1:2, 1:7, 0:1) by varying the concentrations of the metal salts in the standard preparation method . The reason for carrying out these experiments is that we considered that the active sites for the synthesis of hydrogen peroxide were associated with small nanoparticles that might be comprised mainly of Pd with only a very dilute amount of Au. Hence, by examining a wide range of compositions we could examine this hypothesis in some detail . A set of representative bright field TEM micrographs is shown in Fig. 2 and the particle size distributions of the colloidal metal nanoparticles after immobilisation and drying on an activated carbon support are shown in Fig. 3. The median particles sizes for the monometallic Au and Pd colloids were found to be 3.5 and 5.4 nm, respectively. The median particle sizes for all the Au x Pd y alloys were in the 2.9–4.6 nm range, and did not show any discernable systematic size trend with colloid composition. This shows that the method can be used to make a range of supported nanoparticles which have very similar particle size distribution, but have the potential for widely varying compositions. STEM-HAADF images of the alloy particles in the 2:1, 1:1 and 1:2 Au–Pd samples are shown in Fig. 4. In each case, the metal particles were found to be random homogeneous Au–Pd alloys with an f.c.c structure. Energy dispersive X-ray spectra acquired from areas containing ~100 metal particles showed both Au and Pd peaks suggesting intimate mixing of the two elements in the alloy samples. In addition, the relative Au to Pd peak areas from the ~100 particle average spectra qualitatively agreed with the nominal x and y values for each of the Au x Pd y alloy compositions. However, it was noticeable that within specific Au x Pd y samples, XEDS spectra obtained from individual particles did show considerable composition variations as a function of particle size. This is demonstrated by a set of HAADF images and corresponding XEDS point spectra from particles at the low, median and high ends of the particle size distribution for the Au:Pd (1:7) sample (Fig. 5). Whilst all the particles were homogeneous Au–Pd alloys, the smallest particles were Au-rich, whereas the largest ones tended to be Pd-rich. It is interesting to note that this systematic composition/size trend is diametrically opposite to the situation found for Au–Pd nanoparticles prepared by impregnation methods where the larger particles tended to Au-rich and the smaller Pd-rich. The supported Au–Pd catalysts were investigated for the direct synthesis of H2O2 and the results are shown in Fig. 6 . The catalysts were found to be particularly effective for this reaction and the synthesis activity exhibited a maximum at Au:Pd = 1:2 molar ratio. In our previous studies using catalysts prepared using the impregnation method [16, 17, 18, 19, 20] we used an Au:Pd mol ratio of 1:1.85, which is very close to this optimum ratio. However, the catalysts prepared by sol-immobilisation are considerably more active than those prepared using the impregnation method [16, 17, 18, 19, 20]. This demonstrates that using the sol-immobilisation method we are able to utilise the precious metals much more effectively, as in the impregnation method a significant fraction very large particles are also generated and these have very limited catalytic activity. In an earlier study  we observed that in the catalysts prepared using the impregnation method, the very smallest particles were mainly Pd and that 3–5 nm Au–Pd nanoparticles comprised typically 98 % Pd to 2 % Au. As the activity was considered to be associated with these small particles, this led us to conclude that for optimum activity we needed to find a method to fabricate such particles. However, the results of the sol-immobilised catalysts might suggest that this hypothesis is not necessarily the case, since the Pd-rich Au–Pd colloidal nanoparticles (i.e. Pd:Au ≥ 3) actually display a lower productivity than those with a Au:Pd = 1:2 molar ratio. It must also be taken into account that this effect could also be explained on the basis that the hydrogenation activity of the catalysts is expected to increase with Pd content and this somewhat cancels out the positive effect of adding Pd to the Au nanoparticles for the direct synthesis. The catalytic oxidation of benzyl alcohol under free solvent conditions is an appropriate model reaction for exploring the catalytic performance of bimetallic Au–Pd catalysts and the results obtained for the conversion of benzyl alcohol to benzaldehyde are shown in Fig. 6. It is found that the catalytic performance in terms of reaction specificity is not dependent on the composition and all catalysts give high selectivities to benzaldehyde which is the primary product. Hence, the main outcome of alloying Au with Pd is to enhance activity. The activity of the monometallic 1 wt% Au/C sample was very poor, but on increasing the Pd content we observed a progressive increase in catalytic activity. This increase of activity reached a broad maximum with a Au:Pd molar ratio between 1:1 and 1:3. A further increase in the Pd content resulted in a progressive decrease in catalytic activity. It is important to note that even in the presence of a minor amount of gold or palladium (i.e. in the case of 1:7 and 7:1 Au:Pd molar ratios) a significant increase in the catalytic activity is observed as compared to the mono-metallic counterparts. It is apparent that the activity profile for benzyl alcohol oxidation has the same dependency on the Au:Pd molar ratio as does the direct synthesis and hydrogenation of hydrogen peroxide. It is apparent that carbon-supported Au–Pd nanoparticles prepared by sol-immobilisation are very effective for the three reactions; namely, the direct synthesis of H2O2 and its subsequent hydrogenation and the selective oxidation of benzyl alcohol. For all these reactions we show that the optimum ratio of Au:Pd is ca. 1:1.85. As shown in Fig. 6 the catalytic activity per mol of metal of the Pd:Au series of catalysts for hydrogen peroxide synthesis, hydrogen peroxide hydrogenation and benzyl alcohol oxidation also shows a similar dependence on the Au:Pd molar ratio. This suggests that the active sites for these reactions could be common which is an interesting observation. However, it is also clear that there is considerable variation in the composition of the individual nanoparticles prepared by sol-immobilisation and we are now exploring synthetic strategies that will help to overcome this problem since ideally we need to be able to synthesise bimetallic nanoparticles with both uniform particle size distributions and well-defined composition that does not vary from particle-to-particle.